Adventures in Ceramics offers special, one time only items. On this page you will find special purchase items from outside sources. Everything is priced to move! These are one time only items and can be just one piece or a limited number of pieces. If you want something on this page get it now because once it is gone there are no more. The item comes as pictured and can be shipped immediately. These owls are 4" tall and come in orange, white or blue. They take a standard votive candle or use it as an incense burner. Choose the owl you want by color. 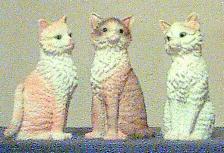 These cat figurines are made of resin and are 5" tall. Choose the cat you want by position: left, center or right. 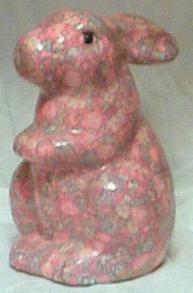 Ceramic rabbit 7" tall with a colorful, flowery finish.